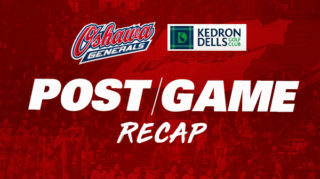 The Generals kicked off the weekend against the Peterborough Petes tonight at the Tribute Communities Centre in the front half of a home and home against the rival team. 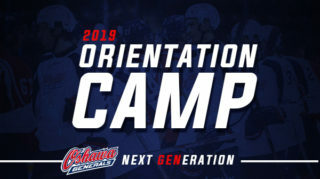 The Gens came into the contest with a 28-18-2-0 record on the season. 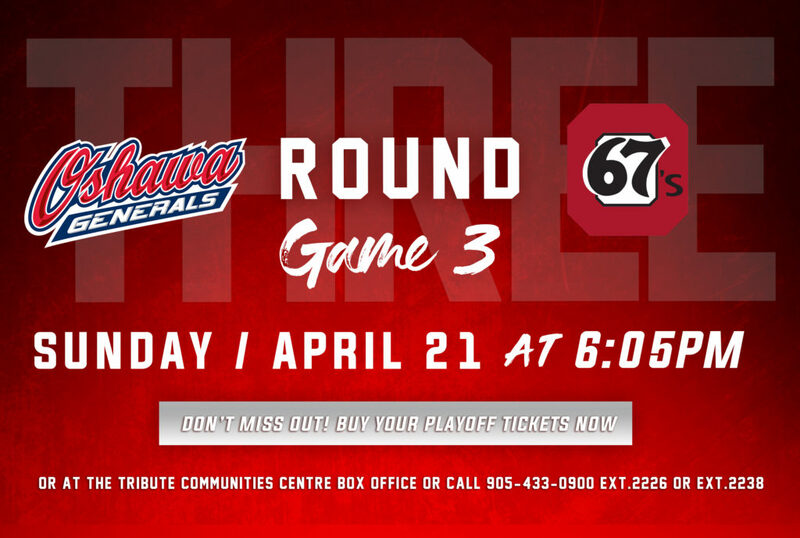 Aiming to start off their three-game weekend on the right foot, Oshawa looked to get back into the win column with a two-point effort tonight. The Gens hit the ice with tons of energy, controlling the play in the first few minutes of the game and generating shots on Petes goaltender Tye Austin. After keeping the Petes pinned in their own end, Peterborough was called for an early penalty to give Oshawa the first powerplay of the game. While the Gens didn’t score on the opportunity, they were able to set up a good cycle and come close on several quality chances. Back at even strength, Oshawa’s dominant play resulted in the first goal of the game after Ty Tullio passed the puck from the boards into the slot where Mitchell Brewer picked it up and put a perfect shot past the Petes. However, just a minute later Peterborough managed to get it right back after Chad Denault potted a rebound in front of the Gens net to knot the game at 1-1. After the tying goal, the Petes were called for a high-sticking penalty to give the Oshawa powerplay another chance. After the unsuccessful man advantage, the Gens took an infraction of their own shorty after Peterborough’s penalty expired. However, it was Oshawa who was able to break the tie with a shorthanded goal by Kyle MacLean, who wristed a shot past the Petes to take a 2-1 lead. 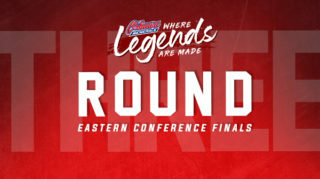 The regained lead was short-lived for the Gens, as they gave up a goal in the last few seconds of Peterborough’s powerplay to even things back up at 2-2. Continuing to find the back of the net, the Petes took the lead a few minutes later with a goal from Semyon Der-Arguchintsev to put them ahead 3-2 going into the second period. 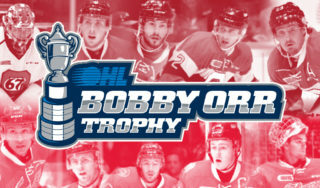 The period began with the Gens killing off a penalty taken near the end of the first period. With a strong defensive effort and a huge glove save from Oshawa goaltender Kyle Keyser, the Gens were able to hold off the Petes powerplay. After the successful kill, Oshawa was quick to take away Peterborough’s lead after Ty Tullio buried a shot to tie the game at 3-3. With their offense rolling, the Gens kept pressing the Petes and were rewarded with another goal when Dylan Robinson cleaned up a rebound to put Oshawa ahead 4-3. Keeping up the trend, the Gens showed no signs of slowing down with Nando Eggenberger sniping a breakaway opportunity top shelf just minutes later to give Oshawa their fifth goal of the night. With twelve minutes remaining in the period, the Petes answered back with a tally off a one-timer in front of the net to put them within one of Oshawa at 5-4. In the latter half of the period, the Gens recovered their two-goal lead when Ty Tullio moved the puck to Danil Antropov who snapped it into the back of the net. With just under three minutes left in the second, Peterborough took an interference penalty to give the Gens a man advantage. Making no mistake on the chance, Brandon Saigeon took a rocket shot top corner for his thirtieth goal of the season and Oshawa’s seventh of the evening. After killing off the majority of a penalty of their own to end the period, the Gens carried a 7-4 lead into the game’s final frame. The period began with both teams exchanging chances, bringing the play from end to end. Five minutes into the third, Serron Noel was hooked on a breakaway that resulted in a penalty shot. Noel put on a nice move on the opportunity but couldn’t get the puck past the Petes goaltender. After the chance, the Petes were called for an unsportsmanlike conduct. Capitalizing on the resulting powerplay, Allan McShane potted a loose puck in front of the net to give the Gens a commanding 8-4 lead. After the goal, a full line brawl broke out that saw five Gens and Petes all fighting at once, with the play resulting in a five-minute powerplay for the Gens. On the extended powerplay, the Gens gave up two shorthanded goals to let the Petes back into the game at 8-6. However, after the penalty expired, the Gens potted an even strength goal by Brett Neumann with a perfect shot, putting them up 9-6. Refusing to slow down, Oshawa’s offense continued to fire with Anthony Salinitri putting a shot off the crossbar and in to give the Gens their tenth of the night. With under five minutes left in the game, chaos continued to ensue when once again several fights broke out on the ice at the same time, including Gens goaltender Kyle Keyser dropping the gloves. The final penalty calls on the play resulted in a four-minute powerplay for the Gens. On the man advantage, Neumann potted his second of the night to give the Gens a huge 11-6 lead. Continuing to pour on the offense, the Gens kept rolling with their twelfth of the night off a shot from Allan McShane. Finishing off the game with their massive lead, the Gens came away with a 12-6 win over the Petes. 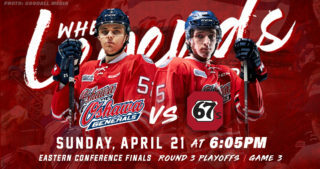 After tonight’s incredible victory over Peterborough, the team’s next home game will be at 2:05pm on Sunday when the Gens host the Sault Ste. Marie Greyhounds at the Tribute Communities Centre. At the game, Dufferin Concrete will be hosting a Chuck A Puck into a Truck during the 2nd intermission. Pucks will be available for purchase for one for $2 or three for $5. Five random pucks will be chosen, and the winners will receive amazing prizes!